its flame, the heat that helped us forge our blades. for the air is thin and that affects our brains. but once on top, only encounter pain. we’ve always had the world in our hands. to climb to its peak is to see below. *Copyright 2014 by Thom Davis. Broadside designed and illustrated by Anita K. Boyle, Egress Studio. Performance poet and musician Matthew Brouwer will offer Opening to the Inner Word: A Daylong Experiential Writing Retreat on Saturday, June 14, 2014. There are just four spaces remaining. See the full description here, the Facebook event page here and the Registration page here. Meanwhile, you can hear Matthew Brouwer TONIGHT, Thursday, May 29, when he will be the featured poet at Everett Poetry Night, 7:00 p.m. at Cafe Zippy. Whether you go as part of a competing team, as a volunteer, as a sponsor or as a member of the audience, the 25th National Poetry Slam in Oakland, California, should be truly memorable. The premier slam tournament, NPS draws top performance poets from North America and Europe to this week of competition, workshops, outreach and fun. Mark your calendar for August 5-9, 2014, and watch these sites for details on venues, festival passes, competitors and more: the NPS2014 website, Facebook and Twitter @NationalSlam. 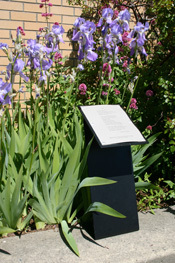 The Port Angeles Main Library is partnering with Olympic National Park to offer Poetry Walks: free access to three trails in the Park with poetry posted on signs along the way. Poets include Raymond Carver, Mary Oliver, David Wagoner and many others. The program continues through Saturday, May 31, 2014, only (sorry for the late notice; just learned about this one). All the details on the NOLS Poetry Walks page and a list of featured poets here. The staff of Jeopardy Magazine invites you to the Jeopardy Magazine Release Party, which will take place at 7 p.m. on Wednesday, May 28, 2014, in the Whatcom Museum Lightcatcher building, located downtown at 250 Flora Street. Jeopardy Magazine is the undergraduate-run literary and fine arts publication of Western Washington University and showcases the unique voices of students, faculty, staff, and alumni each spring. This event is open to all Western faculty, staff, students, alumni and members of the community. There will be readings, refreshments, and free copies of the 50th edition of Jeopardy Magazine. Learn more on the Jeopardy Magazine website, see the event on Facebook and join in the celebration! 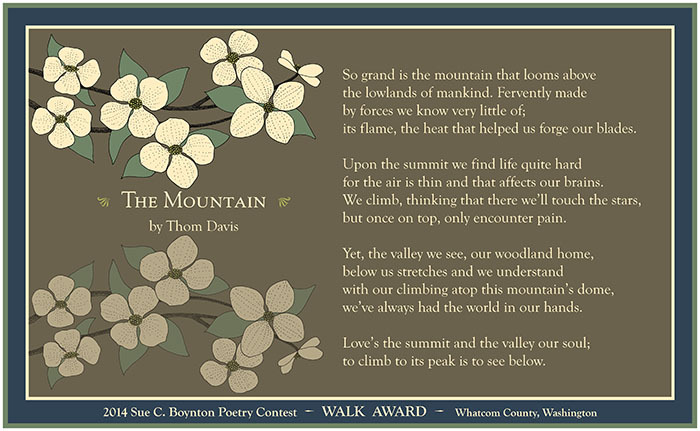 Over the coming months, in no particular order, on no particular schedule, the 2014 Sue C. Boynton Poetry Contest winning poems and their accompanying broadsides will be posted here and linked on the Winners page. Enjoy! I like balancing the checkbook. On both mailed bank statement and my register. Then to the recycling bag for shredding. I add, or more often subtract, missing entries. Rare math errors giving me money are happy surprises. Even when results are sometimes red. Not multifaceted, complex, or conditional. I’d draw one at the top of page 1 when I finish. 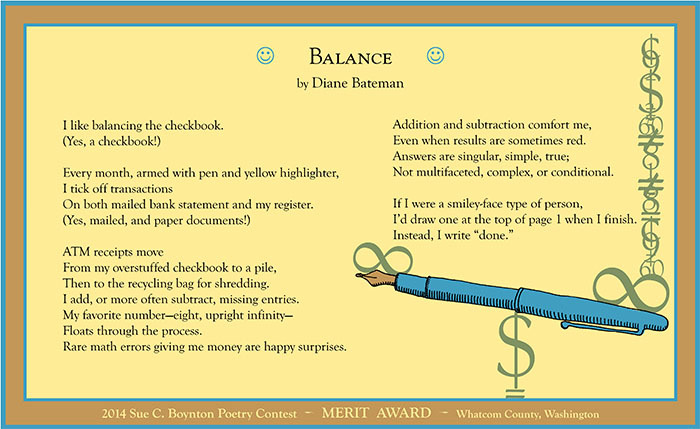 *Copyright 2014 by Diane Bateman. Broadside designed and illustrated by Anita K. Boyle, Egress Studio.